Captain Weird has been living in the attic for a long time. He's accumulated some strange things for his amusement. Unexpected things. He s been collecting for a long, long time now and for some reason he s taken a liking to you. Go ahead. Climb the stair and explore his collection. Mind your step now. And be sure to look way back in the corners and into the dark spaces. That s where true treasures often lie. Horrified Movie Victims Figure Set NEW in Display Box TERROR! HORROR! RUN AWAY! Moleskine Notebook from ROUGH DRAFT TV Show w/Reza Aslan! New, SEALED! Teachers Vinyl Soundtrack LP Immaculate Condition Promo Record w/Bio Info! Vintage Long Beach California Souvenir Views Card Set 1940s Complete! Rare Vintage Jesse Jackson Jigsaw Puzzle COMPLETE! Ganine Bishop Gothic SALON Chess Set Piece Single Piece ONLY! The Girlfriend Experience TV Show Slippers and Sleep Mask! Riley Keough! NEW! Dance Yourself Thin DVD Prevention Fitness Systems New Sealed Exercise! Cthulhu H.P. 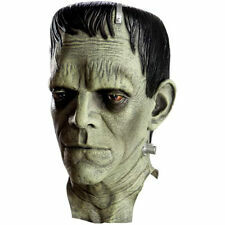 Lovecraft Mask Full-Head Latex Detailed from Death Studios NEW! Star Wars Millennium Falcon Adventure Pack Paper Craft Set! New in Box! Rapper Ice Tea In Ice Cold Blood TV Show Oxygen Ice Tea Maker Tumbler New! Ren & Stimpy Radio Daze MARVEL Absurd Comic # 1! Wonder Woman Super Hero Girls Action Figure NEW in Display Package! Kenner Mummies Alive Action Figure Fright Sight Rath w/Monster Cobra Inside! Twilight Zone Leonard Nimoy as Hansen Figure Collectible MINT on Card NEW! Ghost Towns of Arizona by James E. and Barbara H. Sherman Vintage Edition! Freedom & Liberty Thomas Kinkade Morphing Mug Coffee Cup Brand New in Box! The Art of Olivia Bettie Page 2019 Wall Calendar Brand New! Big Scream TV DVD Haunted Hologram Illusions Volume 1 Viewed Once! Batman Pin Collection from 1989 Featuring Various Batman Artists, Sealed NEW! Flaming Moe The Simpsons Energy Drink Still Sealed! Rare Thunderbirds Aloysius "Nosey" Parker Butler Pin Back Brooch New on Card! Screaming Head in a Glass Jar Horror Terrifying Halloween Decor Decoration!